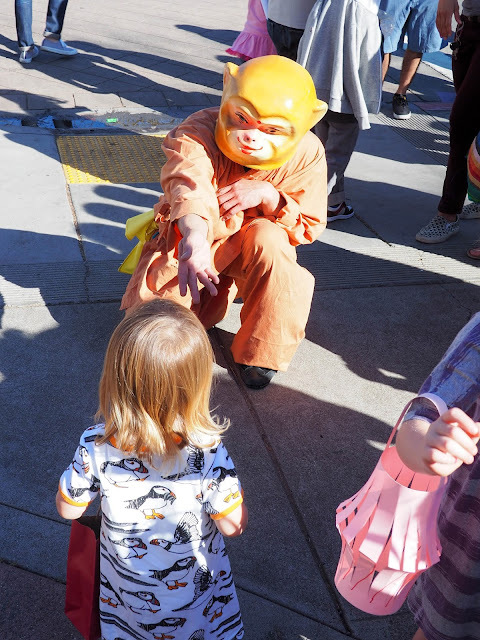 This weekend has been a busy one for us - one filled with lions, monkeys, candy and lots of music! 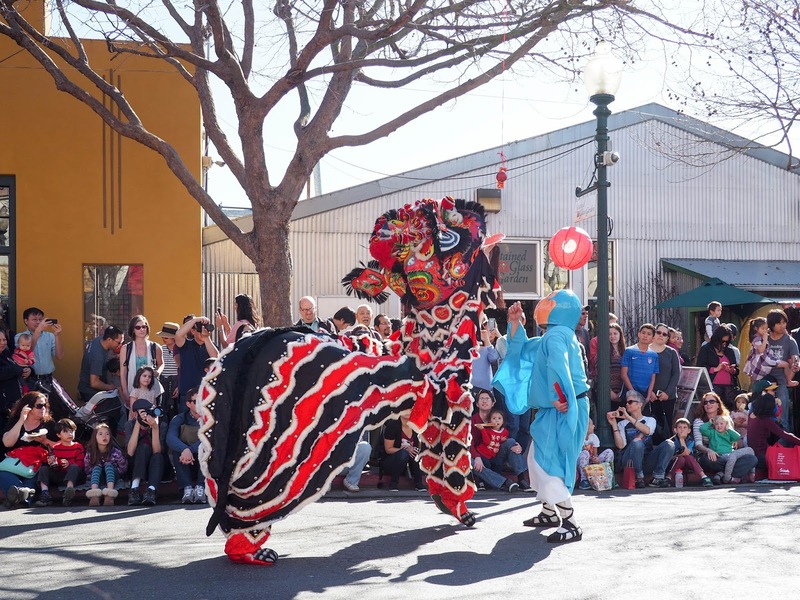 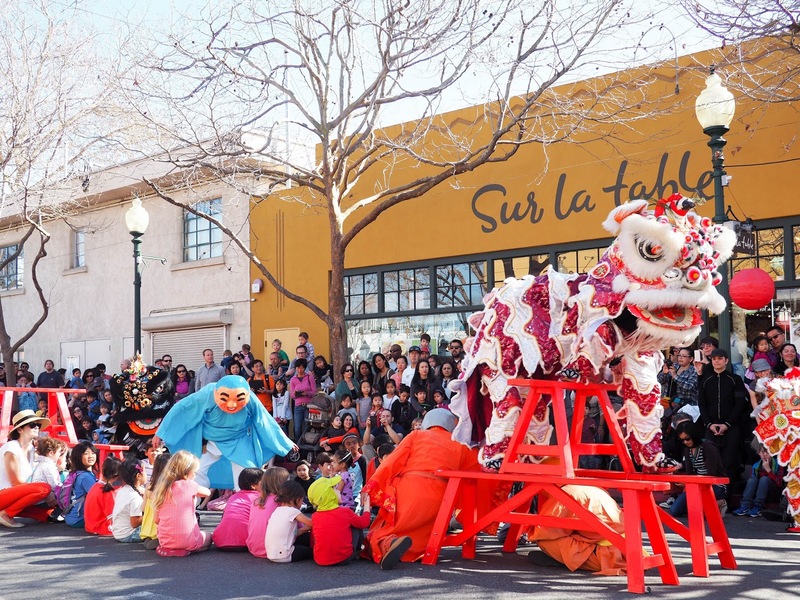 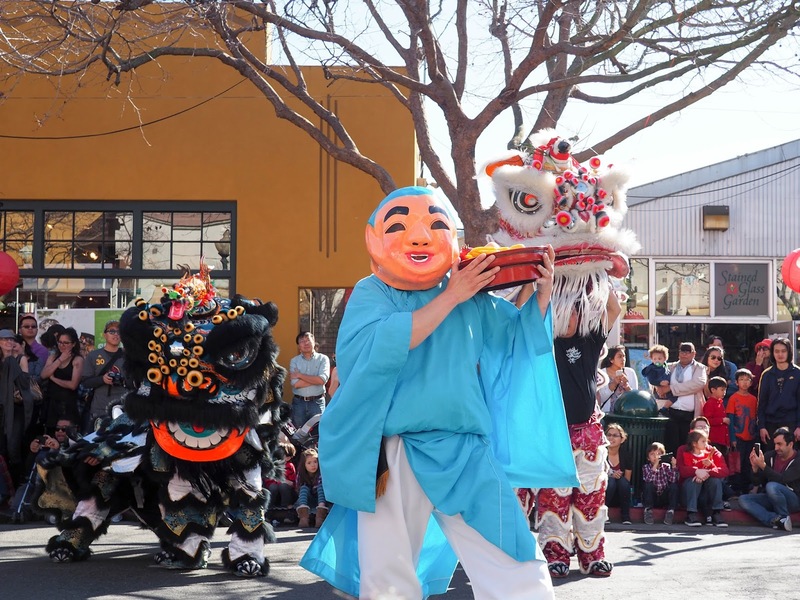 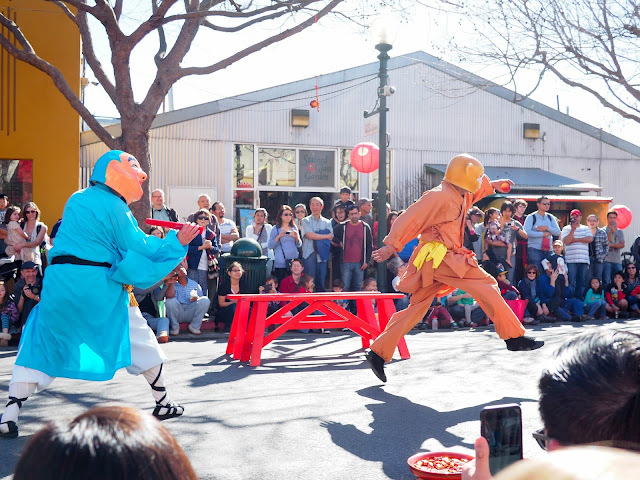 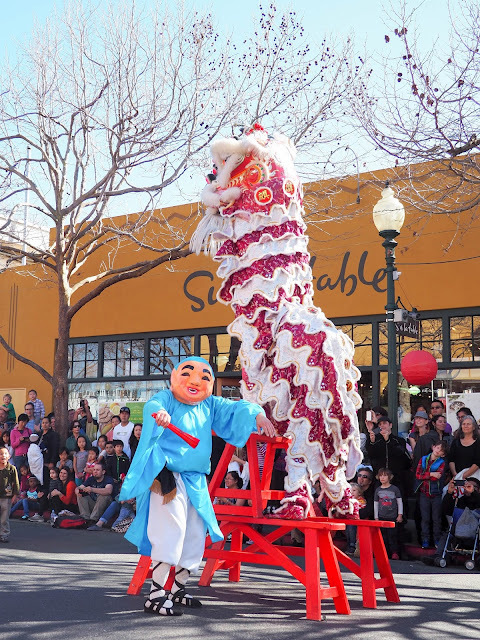 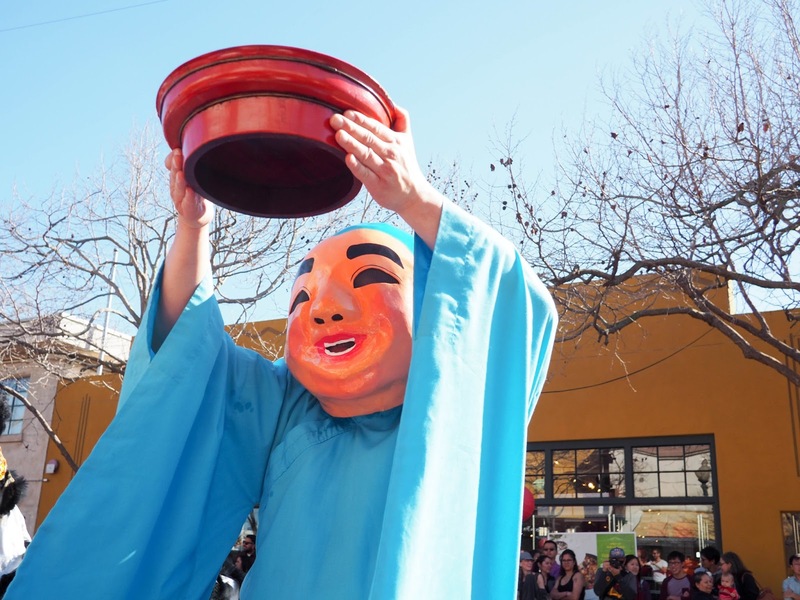 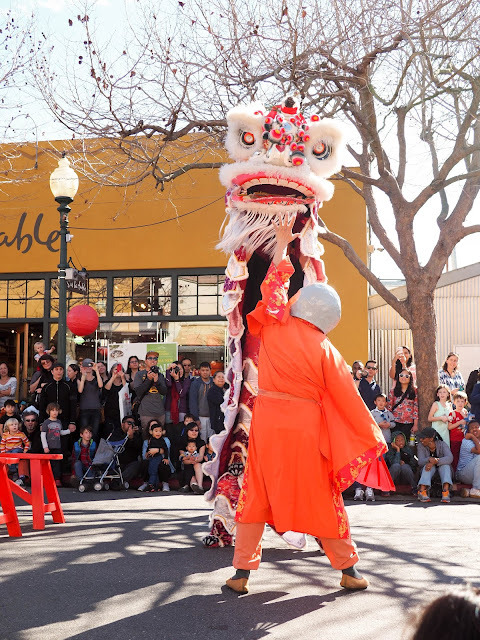 This Saturday we headed to Berkeley's Fourth Street shopping district for the annual Lunar New Year festivities celebrating the Year of the Monkey. 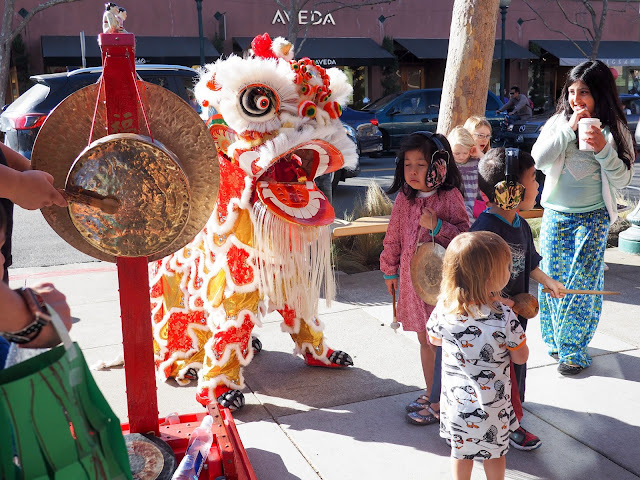 We had attended this particular celebration for the first time last year and it was absolutely perfect for little kids (as opposed to the big festival in San Francisco that can get a little overwhelming), so we were keen to go back again. The celebration including martial arts demonstrations, lion dances, arts and crafts, and a procession along the street with blessings of the local stores. Oh yeah, and candy. 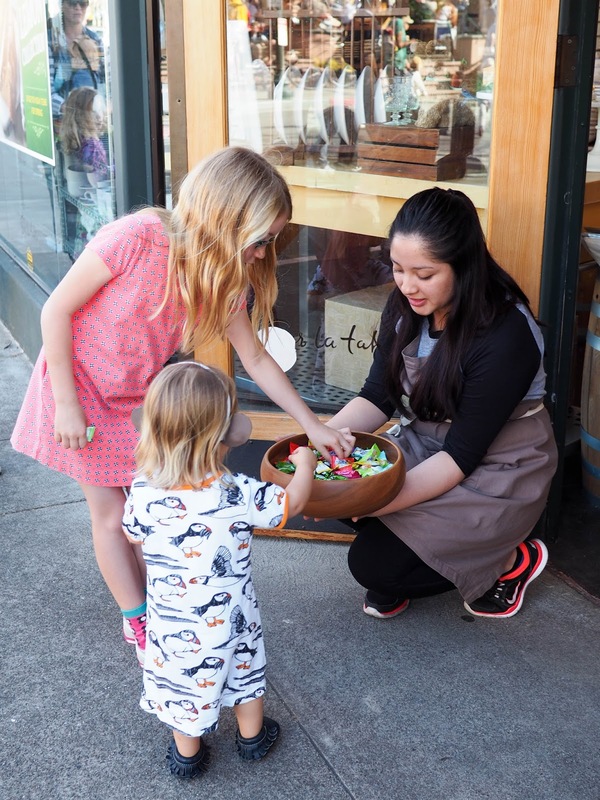 Lots of candy! Just like last year, we arrived just in time for the lion dance. 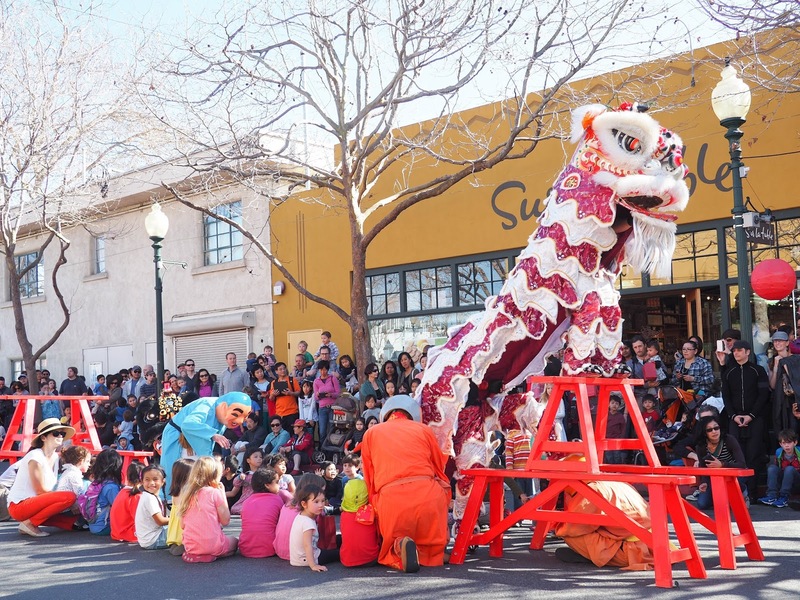 The lion dance was a huge hit with the kids. 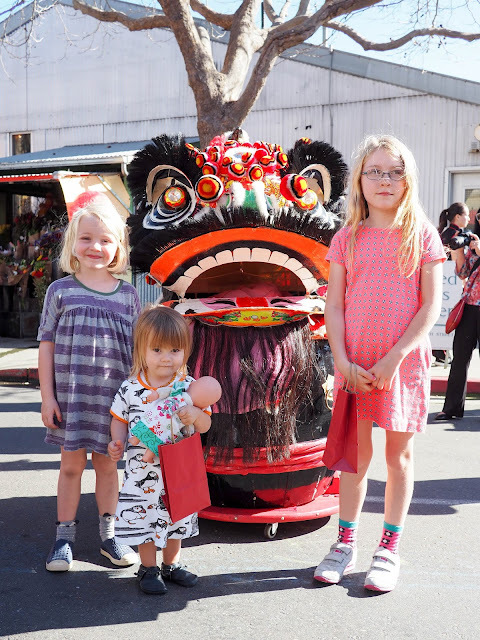 The girls loved watching the lions dance and shake to the music, especially when they got up close. Mathilde danced along to the music from the sidelines, and Ava even got to join in the performance! Ava remembered that there had been audience participation last year so she was eager to join in this time given the chance. And she was given the chance - and a pair of monkey ears to wear! 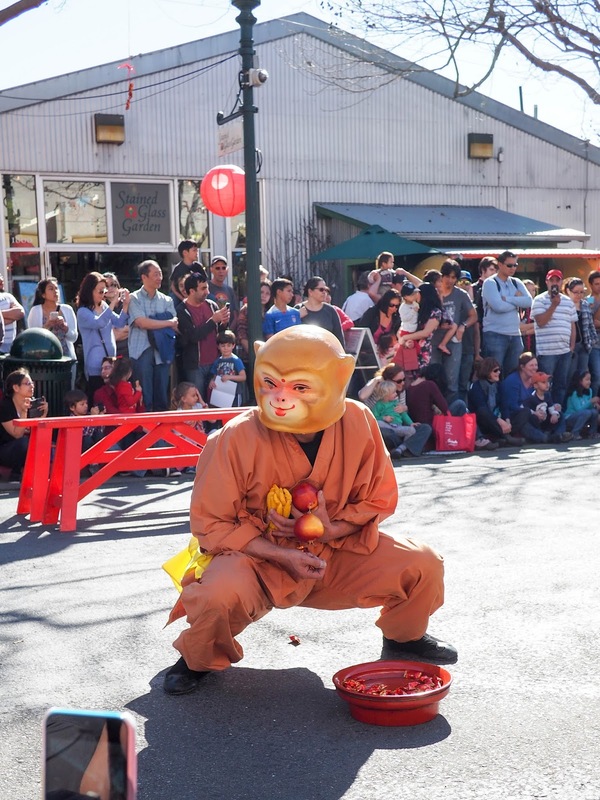 This year's dance focused on a story about a monkey stealing an offering of fruit laid out by monks. The monks discover that the monkey has stolen the offering and recruit lions to help get the fruit back. 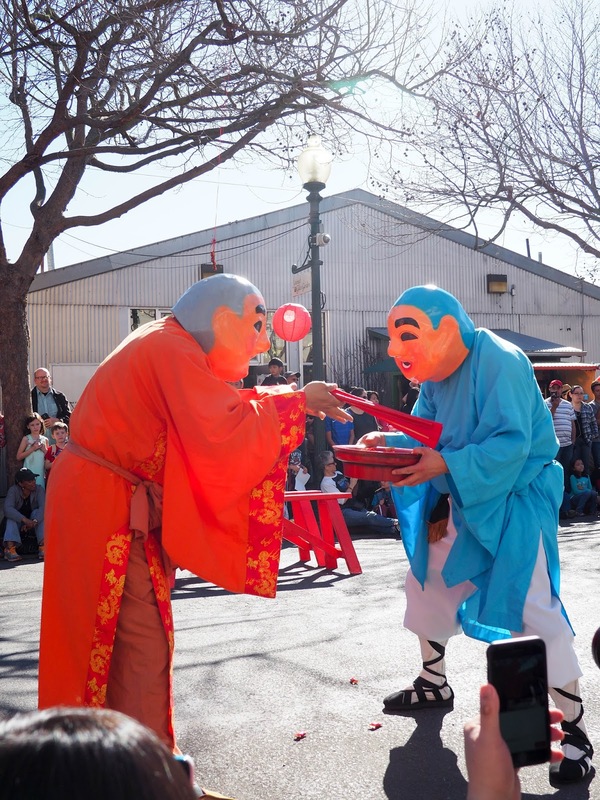 After much excitement, including participation from little monkeys in the audience, the monks have all of the stolen fruit back and the offering is given to the owner of a local tea store who helped organize the New Year event. This marks the end of the lion dance and the start of the procession through Fourth Street blessing the stores. 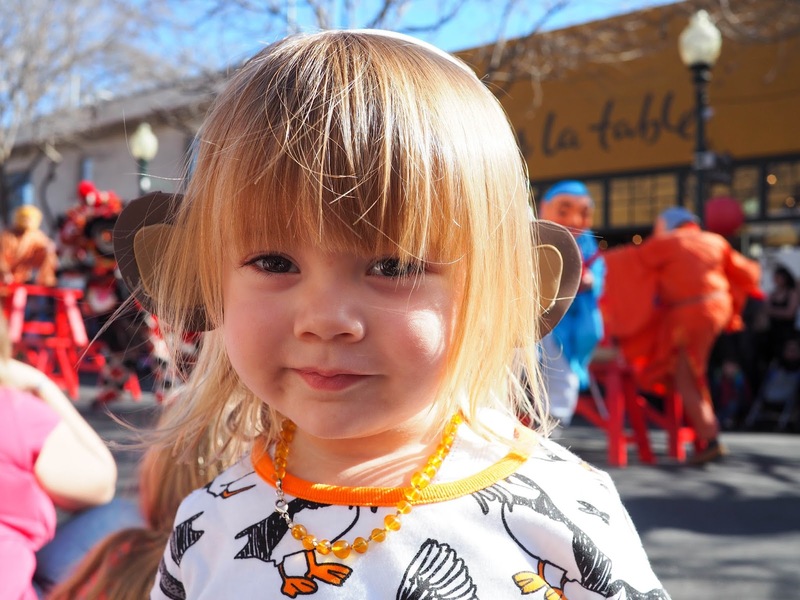 Oh, and those monkey ears that Ava got to wear? 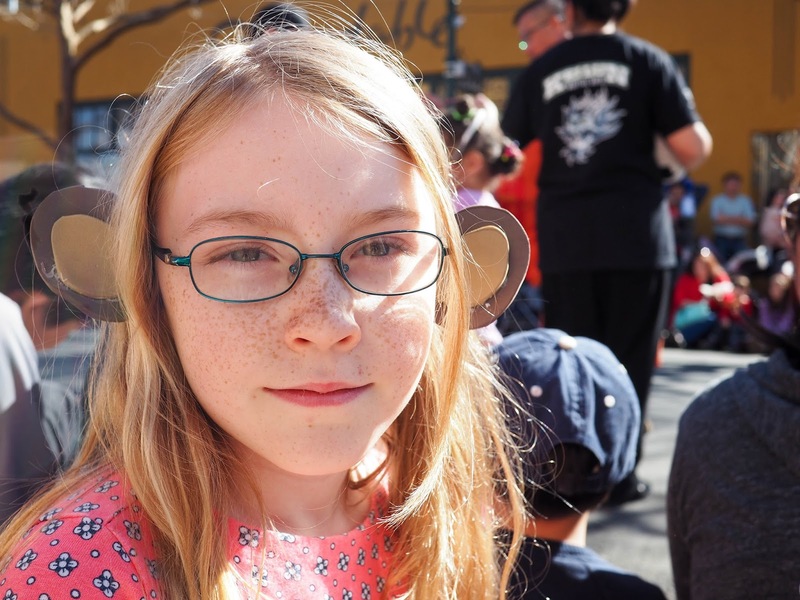 My littlest monkey decided she needed to wear them too! 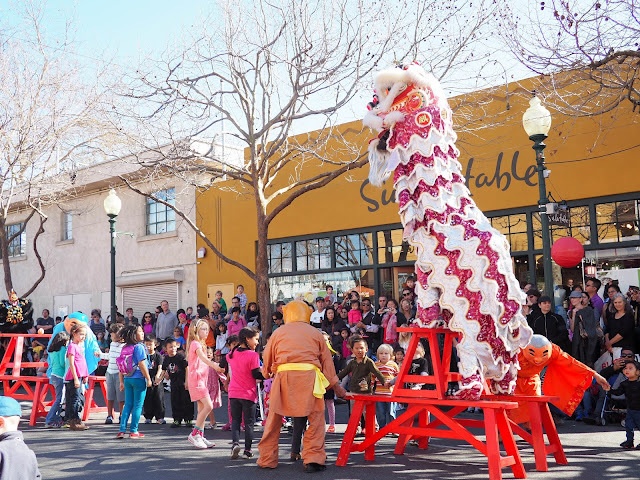 One of the girls' favorite things about the Lunar New Year celebration in Berkeley is that the stores taking part give out candy to children. 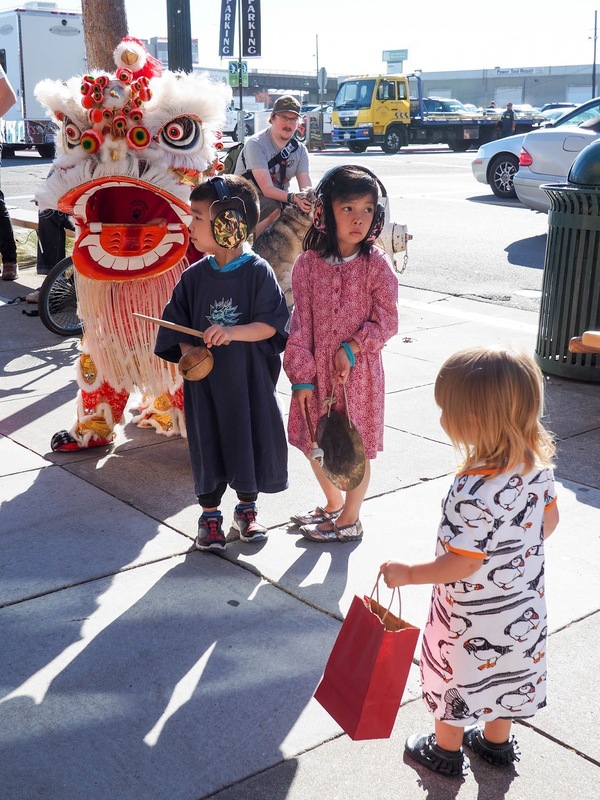 Last year the girls had decided to go collect candy after the store blessing procession but they found that many of the stores had already run out. 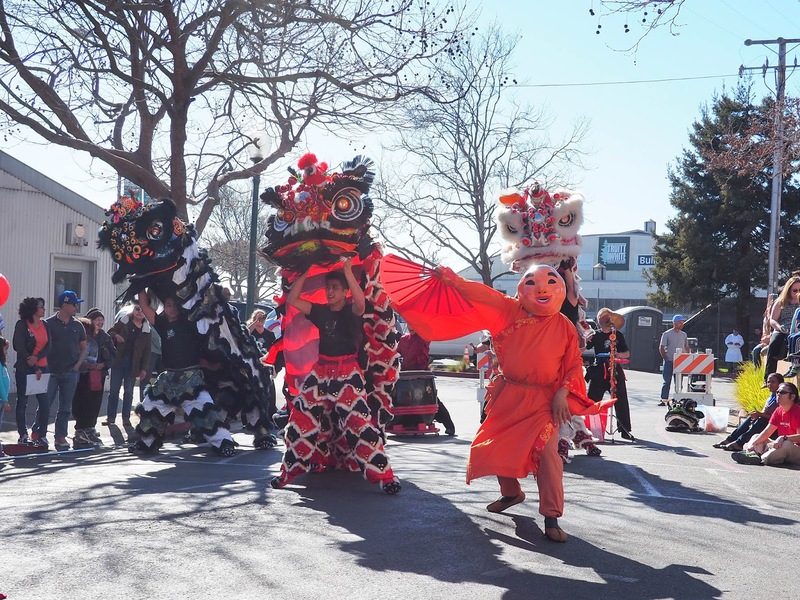 So, with collecting candy being their number one priority, they decided that this year they would collect candy while the procession was taking place. 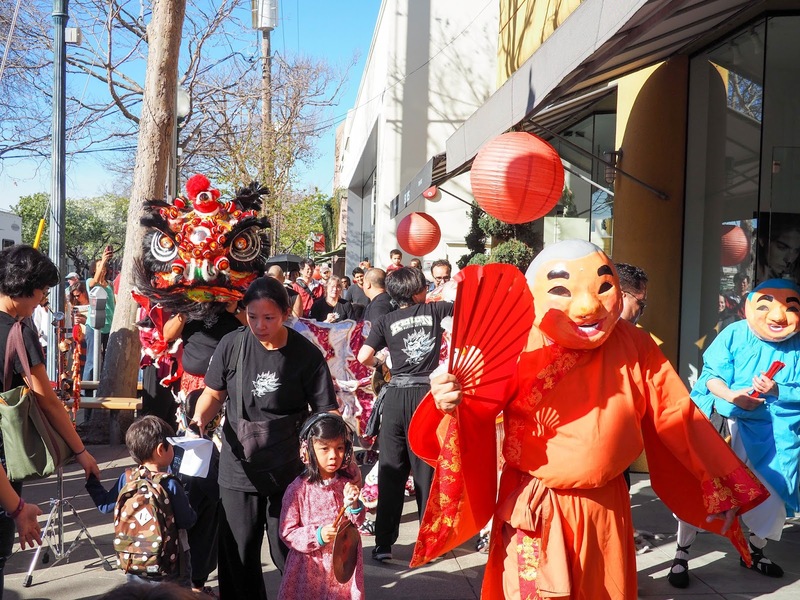 So they each grabbed a red bag and set off visiting the nearby stores. 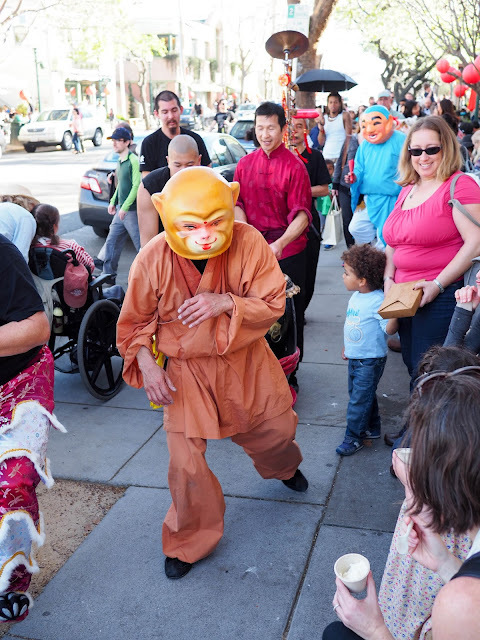 Along the way we did happen to bump into the procession a couple of times. 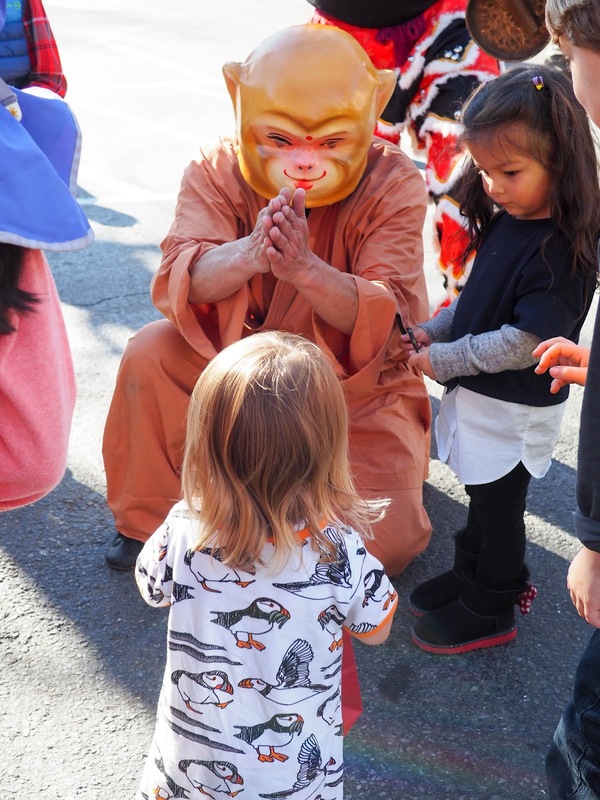 Mathilde was intrigued by the monkey and for some reason she seemed to think that she had to give him her bag of candy! 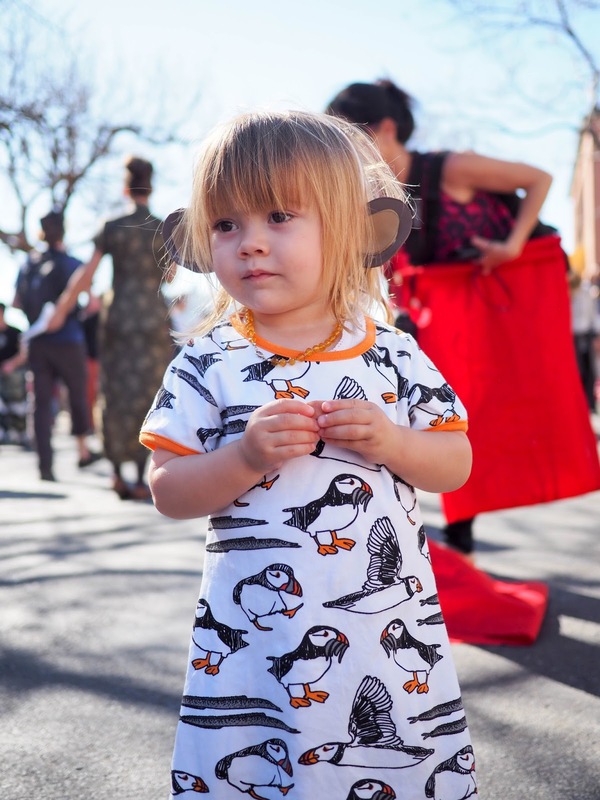 On two different occasions she walked up to the monkey and handed over her little red bag. Luckily he wasn't such a cheeky monkey after all and he gave it back to her both times. Once the girls had visited all of the stores that were giving out candy, we focused on watching the rest of the store blessing procession. 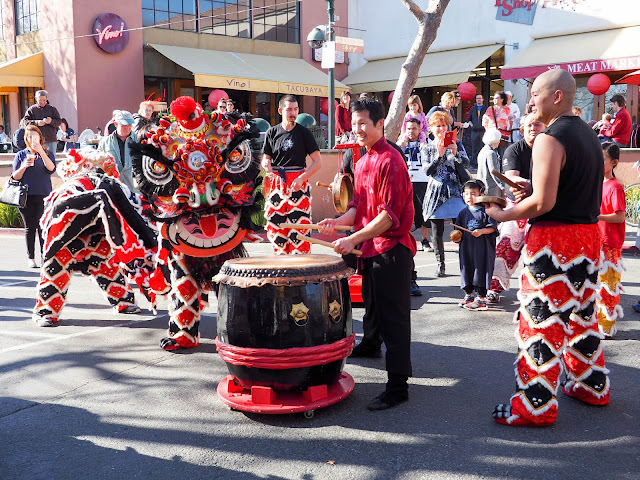 Two lions, the monkey and two big headed monks visited each store taking part in the celebration while a band of musicians followed. 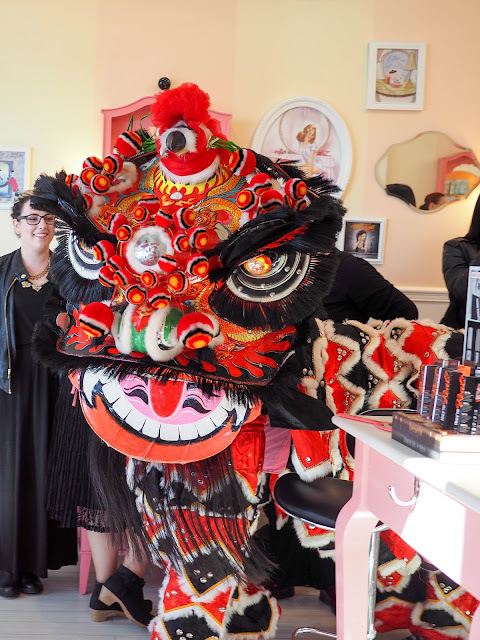 We weren't able to follow them into all of the stores, but I did manage to squeeze into the Benefit store during the blessing. 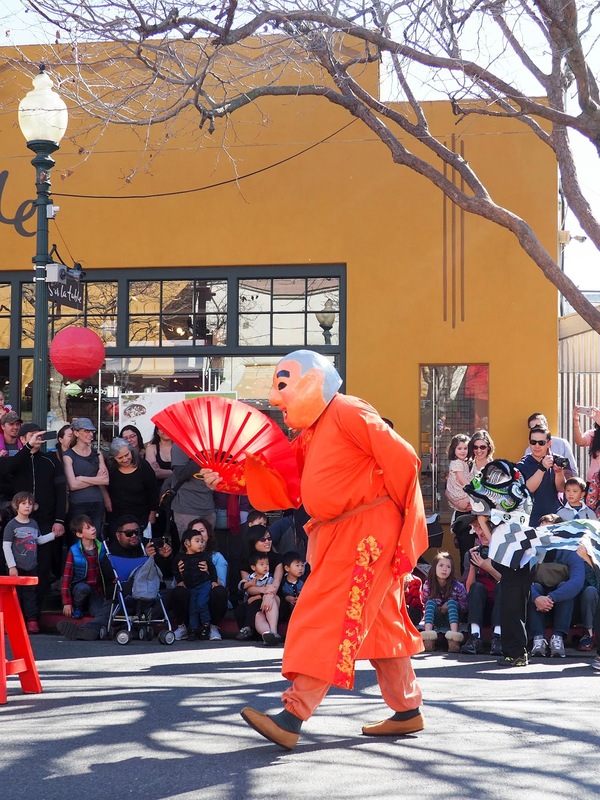 I couldn't help but laugh as the monkey danced around in front of a customer having her eyelashes tinted! 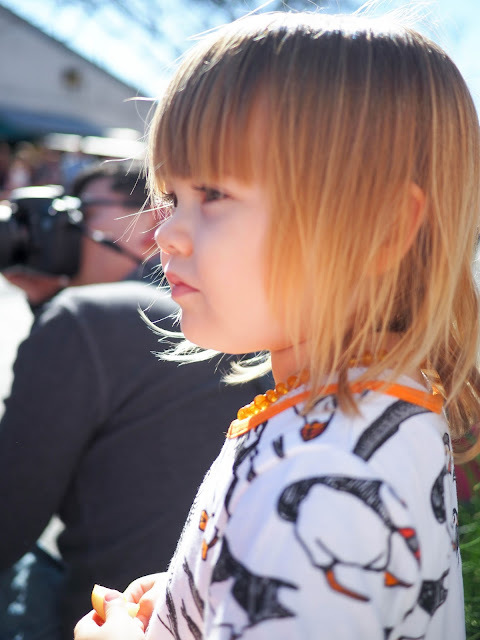 She had her eyes closed the whole time so must have had no idea what was going on in front of her! 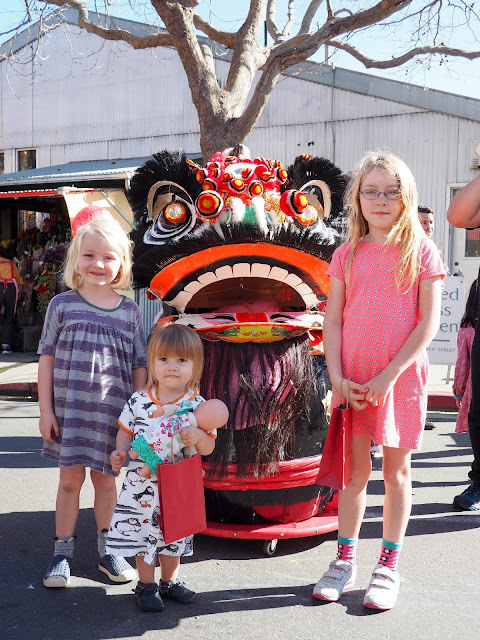 We all had such a fun time at the Lunar New Year celebration. The girls were happy with their candy haul and they thoroughly enjoyed the lion dance. 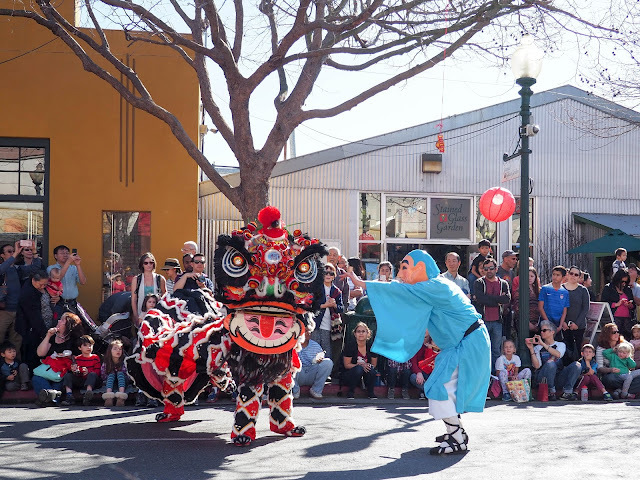 As you can see from the photos, it was a beautiful, sunny day so it was also lovely to be outside enjoying this California Winter weather. 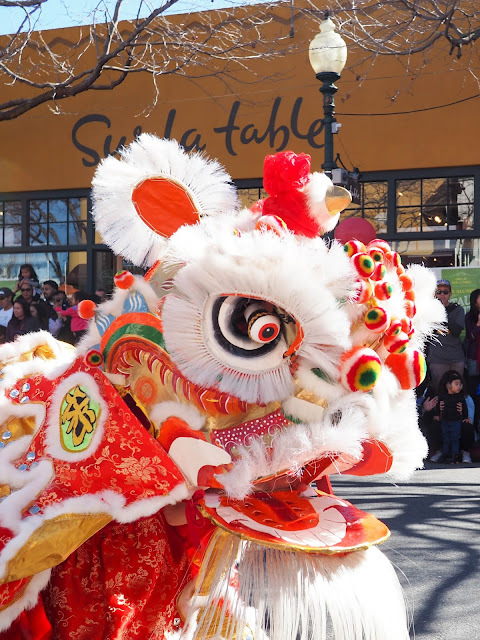 This coming weekend San Francisco will also be celebrating the Year of the Monkey with the annual Chinese New Year Parade, the largest celebration of Asian culture outside of Asia. 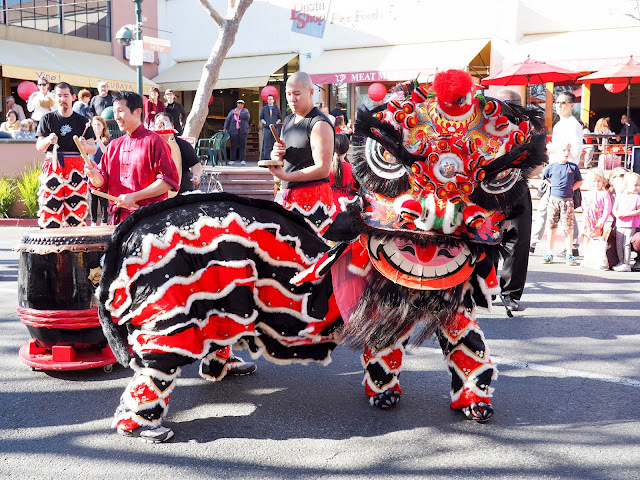 Hooray for festivals and parades!